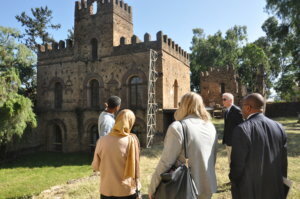 The University of Gondar has had some excellent partnerships throughout the years and a lot has been done to increase the quality of education, development and staff exchanges through these collaborative agreements. 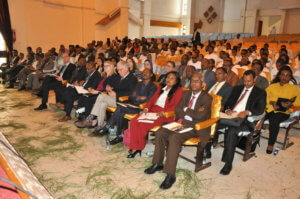 Universities across the globe have partnered with the University of Gondar on a number of levels and have progressed the overall vision of this flagship institution. One of the greater collaborations though have come in the form of a tripartite agreement between the Mastercard Foundation, Queens University, Canada and the University of Gondar. 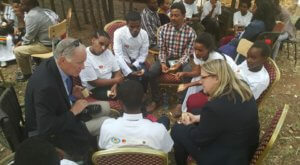 To celebrate this milestone team collaboration the Mastercard Foundation’s Scholars Program at the University of Gondar organized a Celebration that spanned 2 days and covered many activities. The event was held from the 27th through the 28th of November 2018. Leading up to the grand event the first batch of undergraduate scholars had just started their second academic year and a new batch of undergraduate and postgraduate scholars began their new journey at the University of Gondar studying in various fields. 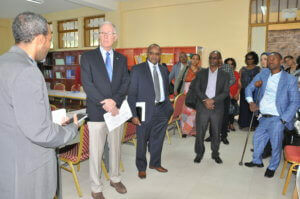 The University of Gondar will educate 450 persons with disabilities and disadvantages over a 10 year span. Talented youth with disabilities and disadvantages from Ethiopia, Djibouti, Eritrea, South Sudan, and Somalia will all be given an opportunity of a lifetime. An all-expense paid education with stipend and essential devices and material are all provided for. For this very reason honorary guests from the Mastercard Foundation, Queens University, the University of Gondar and higher officials from the Ethiopian Government gathered to celebrate this unique program. Just some of the higher profile guests who attended include Jim Leech, Chairman of the Mastercard Foundation Board of Directors and Chancellor of Queens University, Peter Materu, Chief Program Officer of the Mastercard Foundation Scholars Program, Dr. Hirut Woldemariam, Minister of the Ministry of Science and Higher Education, Prof Afework Kassu, State Minister of the Ministry of Science and Higher Education, Mr. Bekele Mengesha, Head of Social Affairs in Ethiopia’s Prime Minister’s Office, Dr. Muluken Adane, Mayor of the City of Gondar, Dr. Desalegn Mengesha, President of the University of Gondar and various other high delegates from numerous sectors. Celebrating the Scholars Program at the University of Gondar is very important to the three larger than life institutions that are involved in the establishment of the Scholars Program at UoG. It is a way to showcase the commitment, vision, aims and overall determination of domestic and international organizations to fight for a more inclusive society. The Scholars Program Celebration at the University of Gondar, in its two day affair, incorporated tours of the various colleges and schools, speeches by distinguished guests, a program overview, an exclusive coffee ceremony, cultural tours of historical places, a conference, school visits and a question and answer session. 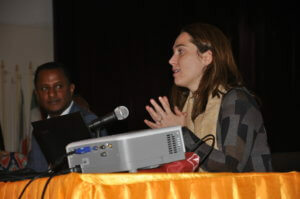 One of the more forward thinking activities came in the form of an International Conference entitled, “Inclusive Education for a Democratic Society.” Presentations by Dr. Heather Aldersey, School of Rehabilitation Therapy Queens University, Dr. Terry Krupa, Professor Emerita Queens University, Dr. Bitew Atnaf, Special Needs and Inclusive Education Wollo University and Dr. Alemayehu Teklemariam, Associate Professor in Special Needs Education at Addis Ababa University showcased that there are ways through research and awareness to get to a more inclusive society. Her presentation provided an overview of the evolution of family- professional partnerships in inclusive schools, outlined the key principles of family- professional partnerships, and introduced a theoretical model in the development to support implementation of trusting family- professional partnerships globally. High profile delegates from some of the world’s oldest and biggest organizations also got a chance to speak about the program. 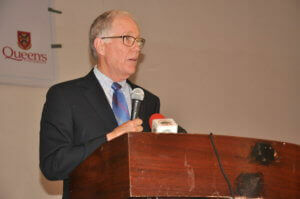 Jim Leech the Chair of the Board of Directors of the Mastercard Foundation who is also the Chancellor of Queens University, which is an educational institution that is crucial to the ongoing partnership graced the university campus with his presence and remarks. The University of Gondar currently has sent multiple staff members to Jim’s prestigious University to get an education that will be useful for the country of Ethiopia. Once these able staff members graduate they will have to come back to Ethiopia to teach others, through a well thought out curriculum, on the ideas of Occupational Therapy. This first of a kind program will be vital in a sense that those with disabilities and mental illnesses will be allowed another medium to get back on their feet and recover. The University estimates that in the 2022 academic year this unique program will be set to start. Moreover looking back at the celebration many interesting bonding moments took shape. During one of the activities the Mastercard Foundation team along with the Queens University representatives sat down in groups during a coffee ceremony to speak to the Scholars. This bonding moment allowed the 2 partners to connect with the scholars on a level of closeness and friendship. They learned some interesting things about the Scholars and their overall struggles as a person with a disability in Ethiopia. The Director of the Scholars Program at the University of Gondar, Dr. Solomon Mekonen, also had a presentation entitled Program overview: The accomplishments, challenges and looking ahead. 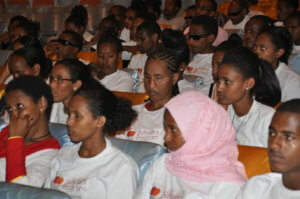 The Scholars Program is different in the sense that it caters mostly to people with disabilities. 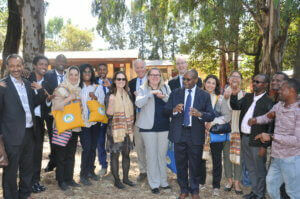 This in fact is a program that is found nowhere else in Africa nor the entire globe. But with that being said the Director of the Scholars Program at the University of Gondar stressed that a lot needs to be done to facilitate a smooth transition into the university without the barriers and road blocks that they are all too often familiar with. Accessibility is without a doubt one of the talking points for scholars in any institutional forum and its clear why it’s such a touchy topic. Scholars who use wheel chairs and tricycles and those who are blind have experienced that ease of mobility in the city and in their previous schools were nonexistent. But Dr. Solomon in his presentation elaborated on the commitment of the university to create an environment where physical barriers are a thing of the past. 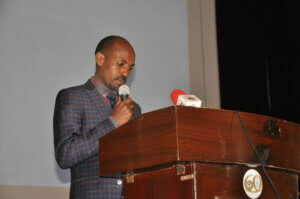 “We have completed an accessibility audit of the university,” stressed Dr. Solomon. He expressed that through the viewpoint of the Scholars Program at UoG no entrance to classrooms, bathrooms, dormitories or cafeterias should be a hindrance. Many of the campuses including the College of Medicine and Health Sciences, Maraki Campus and Tewodros Campus have seen a transformation in accessibility. Buildings and rooms which were first built without such accommodations have been demolished partially to make these access points a reality. And in the future Dr. Solomon has made it a priority for the University to keep people with disabilities in mind when constructing educational and recreational facilities. The Scholars Program Celebration will be sure to resonate in the hearts of the Scholars and more importantly the many guests who attended. These Scholars are the future of the country and are expected to be transformative leaders in every aspect of their daily lives. And with the Celebration at an end they will now have to think of ways to give back to their community through concepts that are forward thinking and effective. But with that being said from the upward trajectory of their potential and ongoing work the Scholars Program and the University of Gondar as a whole believe that they will be sure to hit their mark.